When I first launched my online store, I generated a lot of sales early on by advertising with Google Adwords. And even today, orders from Google Adwords still represents a significant chunk of our monthly revenues. But here’s the thing about Google Adwords or any “query based” advertising platform. While your ads can be extremely profitable, the amount of customers you can possibly reach is limited by the number of searches for your targeted keywords. And for the past several years, we have more or less maxxed out our Adwords reach. Even if we were to increase our budget, our Adwords traffic would not increase. Then, I discovered how to advertise on Facebook and my life changed forever. Facebook Ads Vs Google Adwords – Which Ad Platform Is Right For Your Ecommerce Business? When I first heard about Facebook advertising many years ago, I got so excited that I rushed out and started blowing cash left and right. Not only does Facebook reach over a billion people worldwide, but the average user spends 40 minutes and checks their Facebook page over 14 times a day. That’s crazy! Because of these stats, I immediately signed up for an account, designed my first creative and pointed it at my top selling products with a $20/day budget. Facebook allows you to get very specific with your audience so for this ad, I targeted recently engaged women who lived in our highest performing states in terms of sales. And guess how it performed? It did horribly! I blew through two hundred bucks in the first 2 weeks without a single sale! The ad was getting lots of clicks but apparently no one wanted to buy anything and I knew something was grossly wrong. Now to put things into perspective, it only took a few days before I made my first sale using Google and many of our Adwords ads were profitable almost immediately. But Facebook was a completely different beast! Overall, the mistake that I made with my first Facebook ad is a very common one. You can’t just throw up an ad and point it at your products. Running profitable Facebook ads requires a completely different approach. In order to run a Facebook ad properly, you first have to understand the main difference between how a Facebook ad works versus how a Google Adwords search ad works. When someone does a search on Google, they are looking for something very specific. As a result when they click on your ad, there is a very specific context for their actions. Mary goes on Facebook to see what her friends are up to. She’s getting married in a year but hasn’t started wedding planning yet. Mary thinks to herself “These look great” and then leaves the store because she’s not ready to buy. Mary clicks back to Facebook. Game over! The primary difference between running Facebook ads and Google search based ads is that with Google, your customer has search based intent. 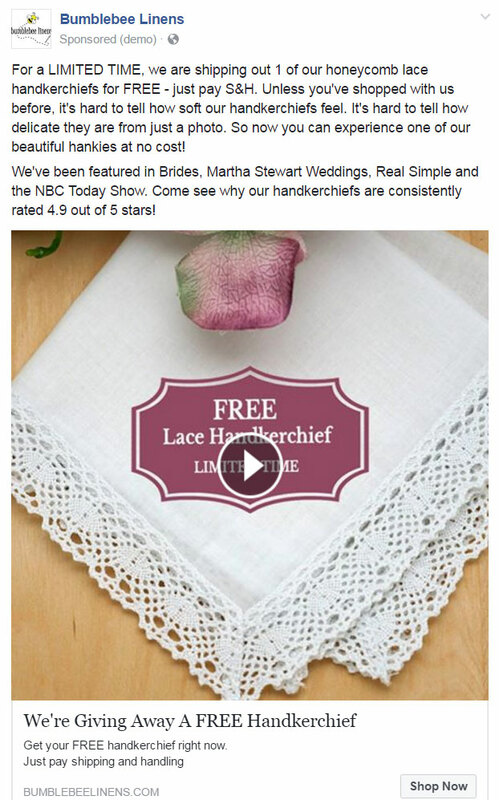 However when they click on a Facebook ad, they may have no intention of buying anything at all. With a Facebook ad, the user is only interested in consuming content and understanding this difference is the key to your success with the Facebook ads platform. Because most people browse Facebook to consume content, the chances of closing a sale on your first encounter are very slim. In fact, it can take upwards of 4-8 touchpoints before a customer decides to buy. As a result, your Facebook ad campaigns need to take your customer on a multi-stage journey. And when it comes to calculating your return on ad spend, you must take into account the numbers for all of these stages collectively. In this post, I will refer to 3 types of Facebook campaigns. Top of funnel ads target cold customers who are discovering your brand for the very first time. They have no idea who you are so your first objective is awareness. You need to clearly convey what your company sells and your unique value proposition. This can be accomplished either through the advertisement itself or through a landing page. In the top of funnel, your goal is to get a lead through email, Facebook messenger or push notifications. For further reading on these topics, check out these posts. Alternatively, you can go for a quick sale with an extremely enticing offer. Ultimately, your primary objective is to give yourself the ability to bring customers back over and over again until they are ready to buy. 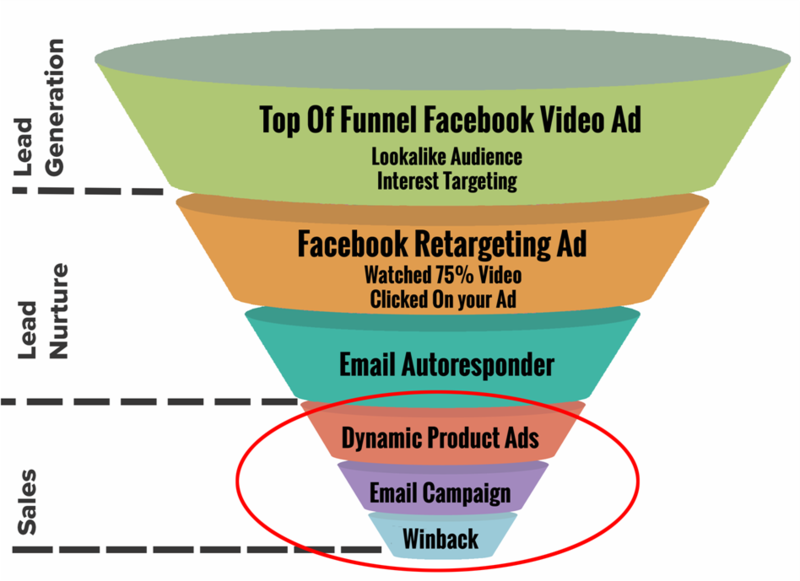 Typically, the top of funnel does not have a high return on ad spend. Most people run top of funnel campaigns at a break even or a slightly profitable rate and use them to generate traffic and leads. The goal of middle of funnel ads is to reinforce your relationship with your customer and to gain mind share. If the customer is in the market for your products, then you want them to think of you first. Typically these ads consist of video or image content that further educates the customer why your company is awesome. The conversion rate of a middle of the funnel ad is much higher than the top of the funnel because a customer is already familiar with your brand. At this stage of the funnel, ads can point to advertorials, testimonials or product categories but you aren’t necessarily going for a pure sell. 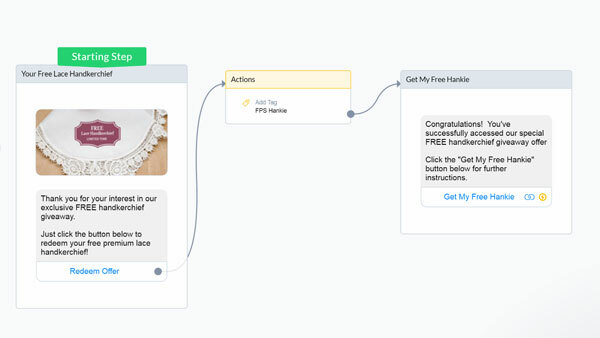 The bottom of the funnel is where you send customers directly to a product for purchase. The bottom of the funnel is reserved for customers who know your brand well, have seen your products and are ready to buy. 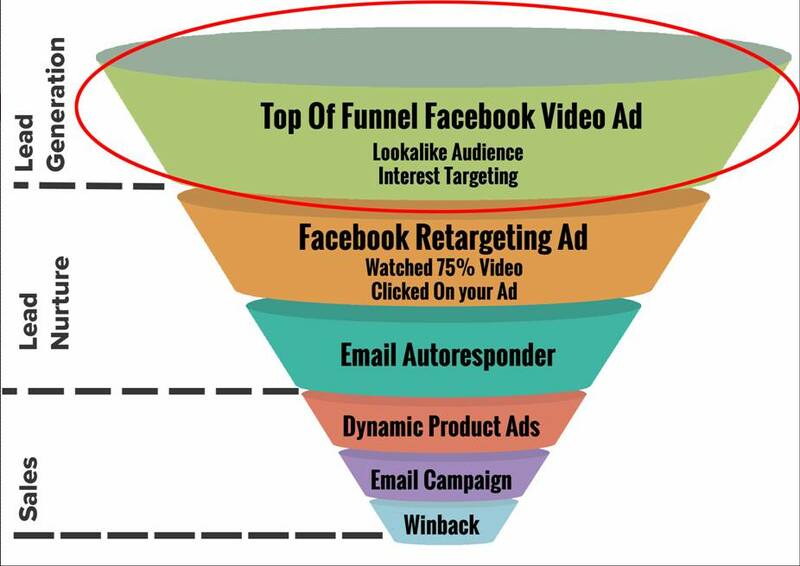 Typically, this stage of your Facebook funnel carries the highest return on ad spend. It’s also where a large percentage of your most profitable conversions will occur. The following example is an ad/landing page combo where I use content to gather leads. 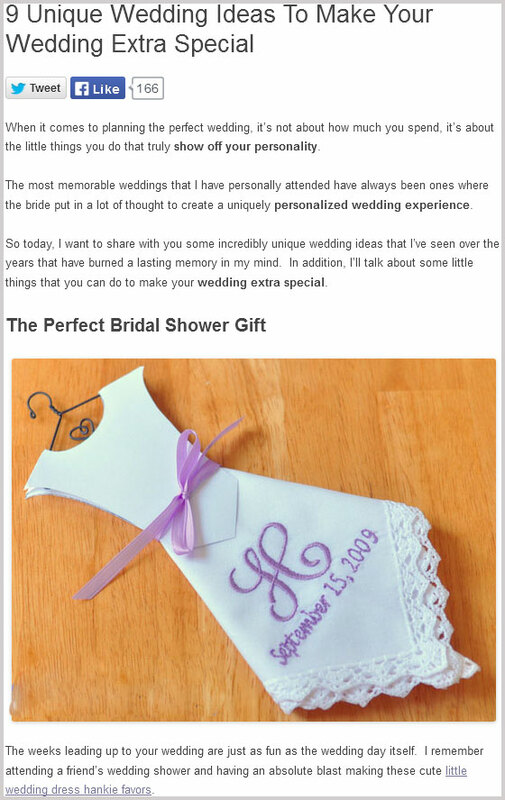 Instead of pointing my ad at a listing of products, I wrote an interesting post on wedding ideas for prospective brides. Here are a few things that I want to point out. 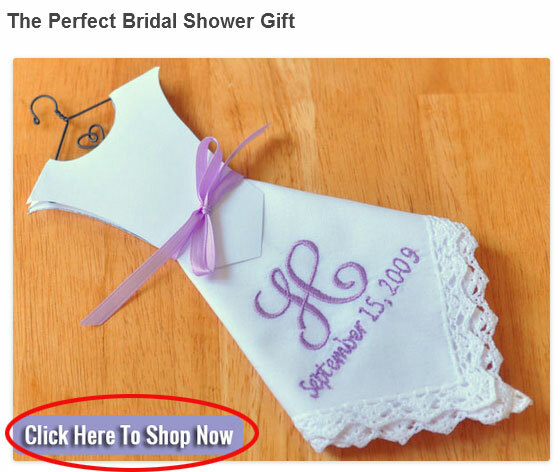 To encourage visitors to visit my store, I also chose to superimpose “click to shop” buttons on the images as shown below. In general, only a small percentage of people will click on these images to make a purchase but those that do end up paying for the cost of the ad. The primary objective of this top of funnel campaign is to grab a lead. Remember, most people on Facebook are there to consume content and they aren’t necessarily ready to buy. As a result, I want these customers to come back to my store when they are finally ready to make a purchase. The easiest way to do this is to get them to sign up for an email list and create an email sales funnel. Once I have a visitor on my email list, I can contact them whenever I want and by keeping them engaged with my content, I can send them regular reminders to come back and check out my shop. Now this customer might not be interested in buying the next day, the next week or even the next month but I can make sure that they are pleasantly reminded of our online store when they are ready. Here are 3 elements your landing page needs to have. First off, you need a lead magnet. 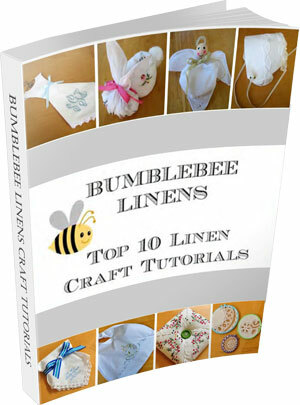 In return for a customer’s email address, we are giving away a free ebook of arts and crafts tutorials. Inside this book is a variety of DIY crafts that a potential bride would be interested in. 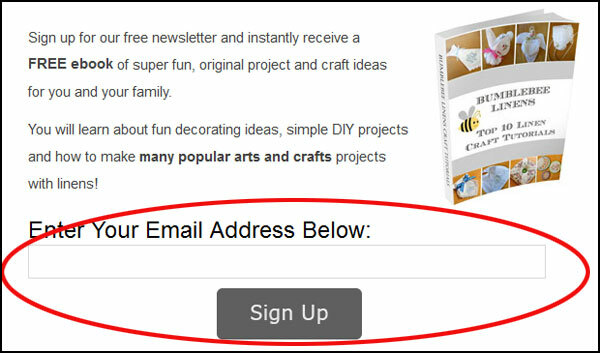 Then, you need to strategically place email signup forms all over your landing page post. For more information on my signup form placement strategy, check out this post. Another way to grab customer leads and sales to cold customers is by running a free plus shipping offer. A free plus shipping offer is an offer where the product is free but a customer has to pay the costs of shipping and handling. The reason this campaign is so effective is because the word “free” stops a customer in his/her tracks and they are enticed to make a purchase immediately. Meanwhile along the way, you are grabbing their contact information. Here’s what my free plus shipping offer looks like. 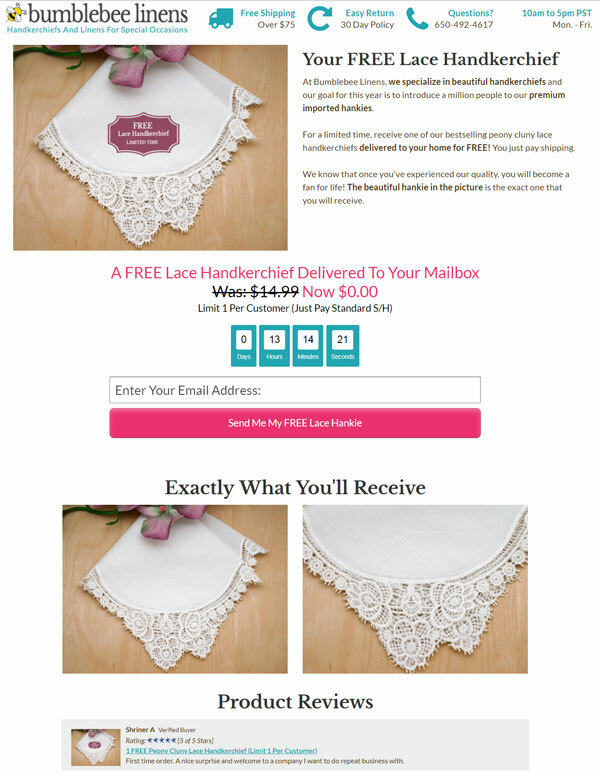 Then, they are guided to my landing page to grab an email and complete the sale. In general, the free plus shipping offer and additional upsells pay for the cost of the ad and I get email leads, messenger subscribers and real paying customers! 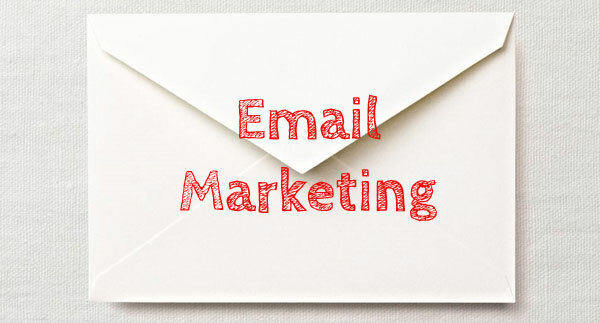 There’s no point in grabbing an email address unless you plan on emailing your customers. So you need to create a multi step email autoresponder sequence to automatically send emails to your list of prospects on a weekly basis. While the details of our email sequence is beyond the scope of this post, the point is that you can automate this entire process. And the key is to not come across as overtly salesy in your emails. Provide the customer with useful content that they actually want to read and occasionally allude to products that you carry in your store. This will not only create mind share for your ecommerce business but when they are looking to buy a product you carry, they will most likely look to your store to make a purchase. 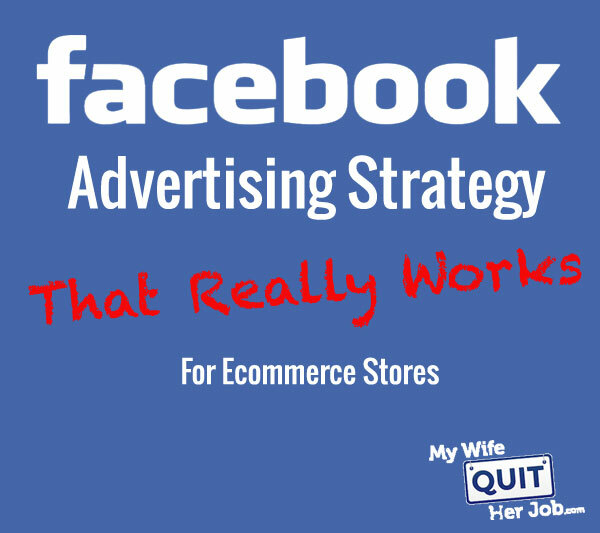 This is the holy grail of how to make Facebook advertising effective. Whereas the top of funnel is designed to grab attention and obtain leads, the middle of the funnel is where you reinforce your relationships. In general, you should use the middle of the funnel to tell stories about your brand, to point out customer testimonials and to send special offers to entice them to go shopping. 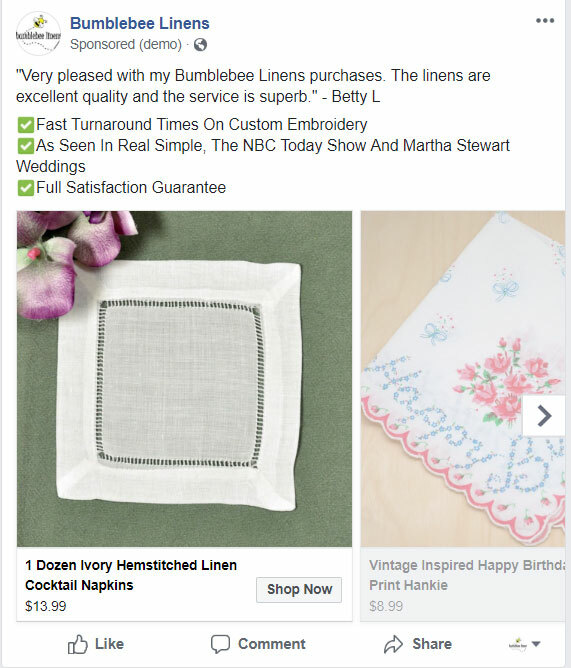 Here’s an example Facebook ad where I use a customer testimonial for my napkins. Your bottom of funnel campaigns will be your most profitable ads and the best part is that they can be run completely on autopilot with Facebook Dynamic Product Ads. 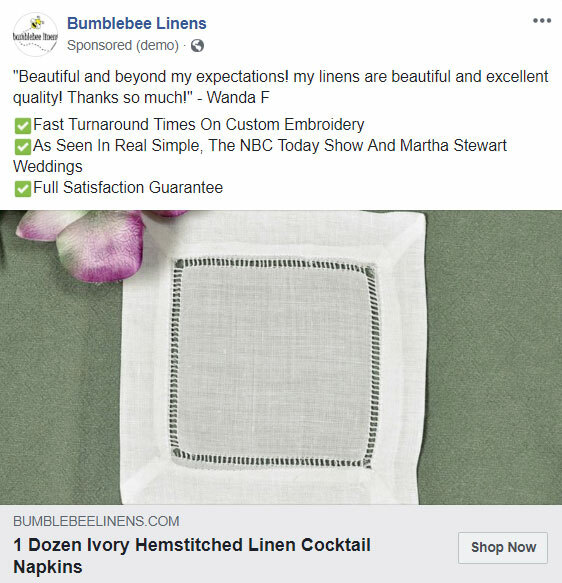 Facebook Dynamic Product Ads are Facebook ads that change dynamically depending on what product a customer browsed in your shop. 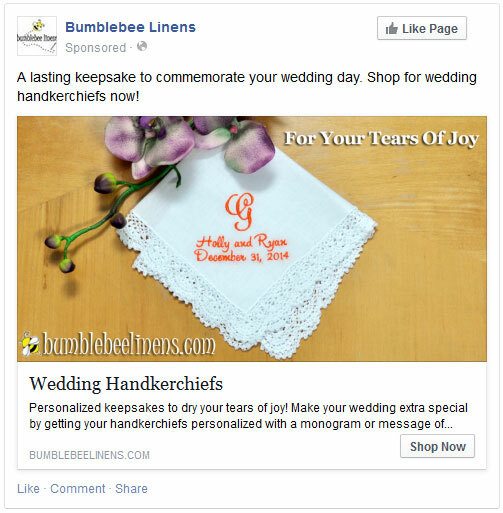 For example, if a customer looked at a vintage blue handkerchief, then they will be shown that exact same handkerchief as the photo creative in your Facebook ad. Here’s what a sample Facebook Dynamic Ad looks like. This one type of ad gets between a 10-12X return on ad spend and is the best Facebook ad you can run. If you’ve digested all of the above, you’ll soon realize that converting Facebook customers requires a much longer term sales process than a query based advertising medium like Google. With Facebook, you have to keep your customer engaged until they are ready to buy. And then you have to bring them back to your store when that occurs. Once you start collecting email addresses, messenger subscribers etc… and engaging with your customers via a dedicated funnel, you will be able to make Facebook ads profitable. I guarantee it! Now there are a ton of little details that I left out in this post in the interest of time. For example, you can also run retargeting campaigns to show ads specifically to customers who have visited certain pages in your store. You can upload your email list and have Facebook generate a “lookalike list” of targeted customers who are demographically similar. You can have Facebook target customers who have already liked your page. What’s really powerful about Facebook ads compared to Google search ads is that you can potentially reach far more people. Anyway if you are interested in learning more about the different ways to implement paid advertising, I cover all of these concepts in my ecommerce course. Feel free to leave a comment below if you have any questions or consider signing up for the class. Thanks for helping to solve this mystery by running all the experiments…I can relate the frustration as my first 2 forays into fb advertising also bombed. Definitely looking forward to changing my intention, and focusing on getting them on my email list first on the next try. Thanks again for sharing this very helpful post! I ended up wasting a decent amount of money until I found the formula. The good news is that once you get it right, the results are fairly consistent. Thanks for this post Steve… you just gave me 101 things I want to try to implement! Hellloooo new autoresponder sequences. Now, I just need to find the time to write all of them, heh. Thanks Anne! I plan on doing a tutorial on autoresponders at some point too. By far the most important thing to utilize with Facebook advertising is the targeting. The precision with which you can target people on there is absolutely absurd. Want to sell “Proud Single Dad” t-shirts? Yeah, you can target recently divorced males with children. It’s kinda creepy, actually, but hey. I completely agree. With all advertising, targeting plays a major role. But the key point is to get people on your list because Facebook doesn’t really let you target based on intent. Oh wow, this was definitely humorous and insightful! I have to learn more so I signed up for your free course. Understanding the consumer psychology behind GA and FB ads are key! It is interesting to read about your different trials as well. I think the pure squeeze pages are going to be edged out by content squeeze pages soon, ie Native advertising. 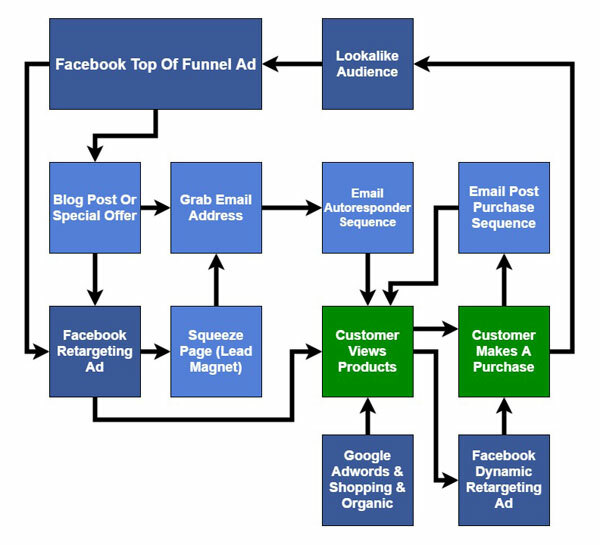 Did incorporating the email funnel sequence make your FB ad spend profitable? I think it depends on what you are asking for. A short squeeze page works well when all you are doing is asking for an email. But long form works better for pricier goods. Email definitely made the FB ads way more profitable. Thanks for this, super helpful. You mentioned that the whole email list process can be automated etc.. Can you teach us how to do that? Once we gather the emails how do we set up the list & set the schedule & content etc. I would love to learn this in the way that you teach. You are very easy to understand. Could you tell how much you spend on ads, per day or month? Yes, Could I use your tactic to apply for my niche site? Now it looks like direct advertising doesnt work at all and thats total bshiizzle! Steve. You are so well articulate on this page – complete with intricate detail – that, by itself, is the convincing piece to get a course prospect to sign up. I especially like how clearly you explain why a Google ad can sell a product straight off whereas it takes a funnel, and many exposures, on FaceBook. Did you write about Facebook Pixel somewhere? I’m having a hard time figuring out whi it is useful and how to add it to my site! This is extremely informational. But I have a question: when you’re creating your top of funnel ad in fb, would you use a campaign objective of Traffic or Conversion (VC, PUR) ? This is in regards to an eCommerce site.